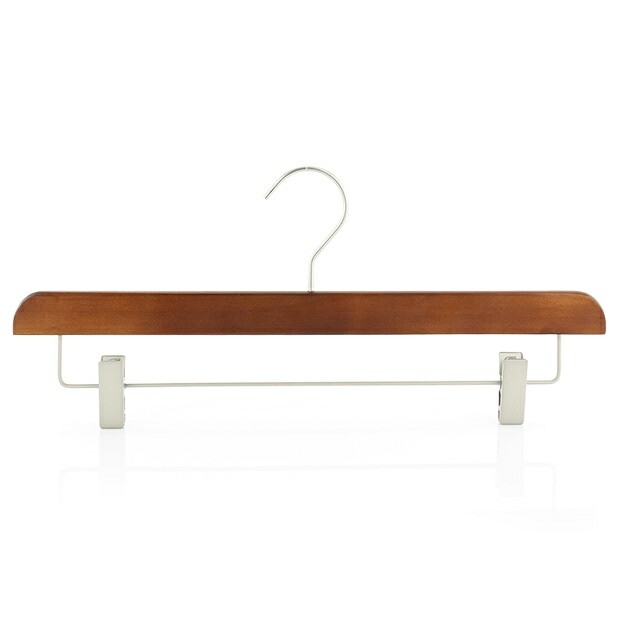 Superior quality clip hangers crafted from strong and durable 100% lotus wood, with a smooth and rich beautiful antique finish, for a classy appearance that will suit any style of room setting. The space-saving narrow profile helps to reduce wardrobe’s clutter and frees up valuable clothes rail space while keeping your wardrobe tidy and your clothes crease free. Two adjustable brushed chromed clips, with soft rubber lined jaws, make this hanger ideal to hang any size of trousers or skirts while giving a modern touch for an attractive and trendy look. These hangers, larger than average hangers, are definitely a great combination of quality and style, that will perfectly match your wardrobe’s needs. AFFORDABLE LUXURY: Made from the finest lotus wood and brushed metal. STYLE: Sophisticated antique chestnut brown varnish finished body, completed by a modern cool champagne metal clips and swivel hook. NON-SLIP CLIPS: Soft rubber lining holds clothes firmly while caring for the fabrics. VERSATILE: Adjustable large clips slides along the full hanger’s width to adapt to different skirts and trousers’ sizes, up to extra-large. DIMENSIONS: w 40cm (15.7”) h 15cm (6”) d 1cm (0.4”).